Yogen Fruz is celebrating 30 years in the business with a giveaway and contest! 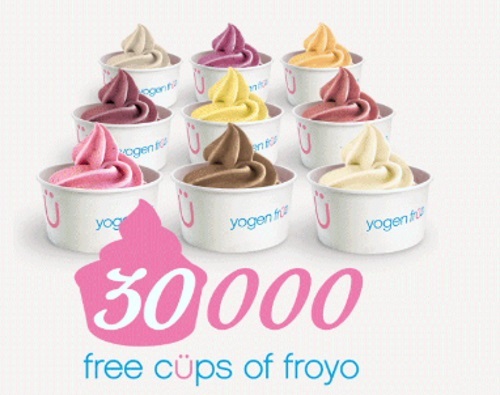 They are giving away 30,000 cups for Free Froyo! Send a Free Froyo to a friend, coworker or someone you luv by telling them at the link below why this person deserves a Free Froyo and you will get a chance to win prizes as well ! Prizes include grand prize trip to the Dominican Republlic, Yogen Fruz gift cards or VIP tickets to a Yogen Fruz 30th birthday party in Toronto! There is a limited number of Froyo up for grabs each day. If you miss out, try tomorrow. Limot 1 entry per person. Giveaway ends June 15, 2015 or while all coupons have been depleted. Offer excludes Quebec.